The relaxation is really starting to hit me now and let me tell you, it is awesome! Day 2 of officially being on holiday and I already feel recharged. We've been waking up without an alarm clock, going for leisurely morning strolls around the neighborhood, picniking in the afternoons and catching up with family or a good book in the evenings. 1. Mix crabmeat, apple and bellpepper together in a bowl. Season to taste, add coriander and fold mayonaisse through until evenly coated. 2. Toast pitabreads until puffed up, then cut open on one side. Stuff with some watercress, then the crab mixture. Serve immediately. 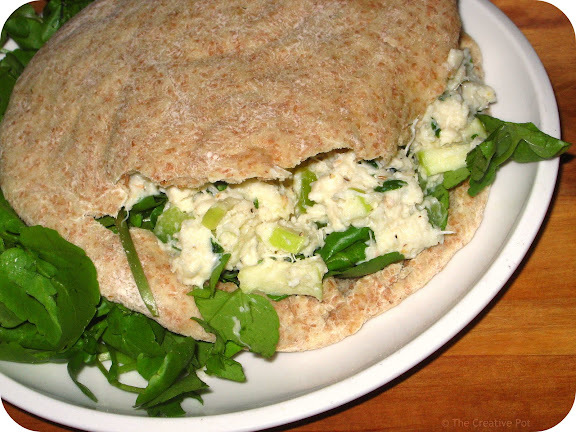 Your stuffed pita looks delicious! I am putting it on my "must try" list! Thanks browniegirl and to you too! I've had a very relaxing two weeks - looking forward to get into the swing of blogging again. I love cooking while on vacation...leisurely cooking however. Nothing too time consuming or intricate. This looks like the perfect recipe for that! Krap klink altyd goed. Net jammer dis nie juis in my daaglikse budget nie!